1. The blog is not over. I will keep writing here, with the encouragement of my employer, and will still talk about strategy game design. I will have to watch how I phrase things, but you can keep watching this space. 2. The podcast is not dead. 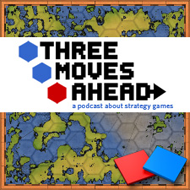 Three Moves Ahead will continue into the future under new organization. 3. I will still be on the podcast, but less frequently because of the conflicts inherent in my new job. I own the podcast still, and will be a jealous father of it for some time. But give Rob time to find his voice and direction. Coming up next week, I will write my thoughts on the 2011 Paradox Convention. I can’t believe the blog and podcast are dead, but at least Rob was quick enough to seize control of everything. So when does this site close up shop?? All merchandise must go now. Isnt there still a conflict of interest if you own the podcast? I give the site a week before it’s all gone. I won’t exercise any control over specific topics or tell the panel what they can or cannot say. I do, however, reserve the right to make sure that if the show does not live up to my vision of what it should be about, to pull the plug. In other words, the podcast will never change its name to the superior “Three Moves With This Wooden Token Ahead of Your Simplifying Video Games”.